Behold, I do not work for Clear Channel. I do not work for Cumulus, or Citadel. The company I work for is not about to go bankrupt, in fact, we have purchased a brand new FM transmitter for the wretched mountain top transmitter site featured here. Am I happy? Oh yes I am. New transmitter = fewer midnight phone calls thus better quality of life for me and my family. A solid state Nautel transmitter means fewer unscheduled trips to the transmitter site and better reliability. As a result of consolidation and smaller engineering departments, almost my entire work day is now scheduled weeks in advance. One little hiccup in the schedule can throw things off for days, resulting in many apologies, phone calls to reschedule, and general wasted time. This is a V 7.5 FM transmitter, very likely the last V series transmitter Nautel ever makes. They have moved on to the NV series. It is replacing the Broadcast Electronics FM5A, which is 24 years old. 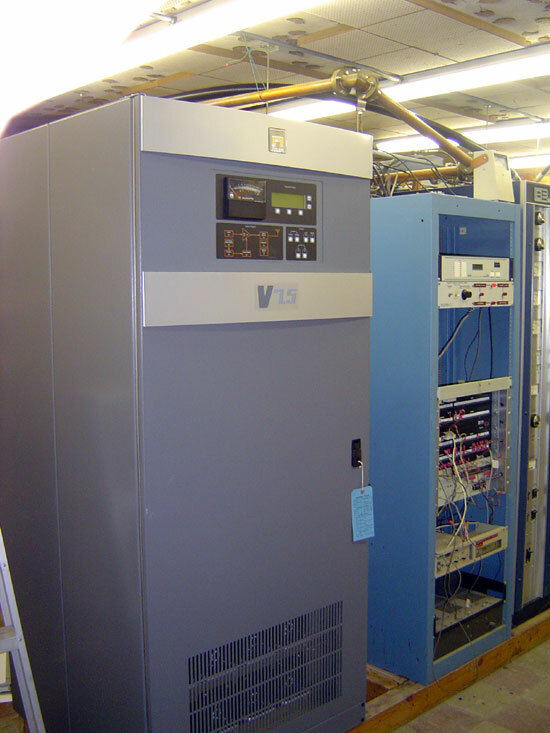 The BE has been a good transmitter, we lost a few rectifier stacks due to lightning over the years, but over all, it has been reliable and easy to repair when problems did arise. This transmitter will be going into standby service. The new transmitter, it sounds awesome.